Occasionally occasions will spring up here. After 7 years silence, an attempt. Pharmacy and Gardens, a short set at 23:00. Do not miss the host Paul Wallfisch at 8:30, the fabulous Marni Rice, or The Snow, all fantastically spooky and lovely to sip a drink to with a loved many. 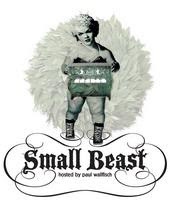 Small Beast is a new music salon curated and hosted by singer/pianist Paul Wallfisch at the Delancey Club in Manhattan. In the intimate and elegant environment of the Delancey's main-floor back room, Small Beast will present an eclectic mix of the world's most creative performers and songwriters. Morex Optimo plays its second show ever in the lovely Budapest, hoping this time to not be breath-alyzed on the Elizabeth bridge at 3 am. More info TBA. With the awesome garage-ticking bomb of Zeroking in the packed and energetic Cabestro! Also, be sure to check out the devastated lounge pop of The Sads! Presented by Panika! Zeroking (fantastic basement indie rock). Presented by Panika! Come see Melorex this thursday at East river bar in Williamsburg. What's Melorex, you ask? MELOREX is the portmanteau name for the smooshing together of "MELOMANE' + 'MOREX OPTIMO' both in name and setlist. This came about when members of both bands were asked to join visual artist Christoph Draeger to re-create the epic performance of the Who's "My Generation" as part of an art installation in Lyons, France. They decided to take the opportunity to learn each other's songs, and the result is Melorex. Come see their trial run before they go to Lyon to wow the kids. Who? will end the night. 10PM - Pretendo 11PM - Melorex 11:55PM - WHO? Celebrate our new lineup, our wonderful little 3 Song CD, and our tour to Europe together with our friends Room.